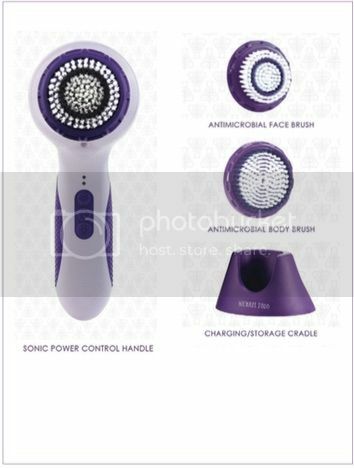 Pammy Blogs Beauty: The NEW Michael Todd Soniclear Elite Face + Body Sonic Cleansing System: Giveaway!!! 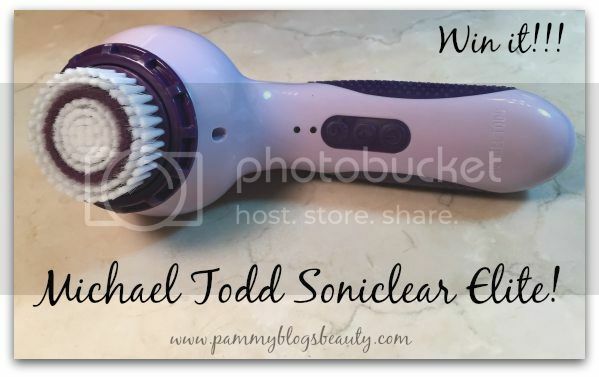 The NEW Michael Todd Soniclear Elite Face + Body Sonic Cleansing System: Giveaway!!! Did you know that Michael Todd has a NEW addition to their Sonic Cleansing collection? Introducing the NEW Michael Todd Soniclear Elite Face + Body Sonic Cleansing System! I am a huge fan of Michael Todd Skincare. Their Knu Serum and Soniclear Brush have been staples in my beauty routine for awhile (be sure to check out my previous reviews here and here, if you haven't already). They are items and products that I always return to in-between testing out other products for the blog. So, when I heard that a new Soniclear was coming out, you know that I wanted to jump at the chance to try this baby out! To find out how I like the new Soniclear Elite and to enter the Giveaway for a Soniclear Elite, please click "read more" below! Essentially, this new Soniclear Elite from Michael Todd is the same as the original Soniclear with the addition of C-BoostTM Collagen Technology. So, you get the same awesome cleansing and exfoliating as the original Soniclear (including the antimicrobial protection) plus now you also get C-BoostTM Collagen Technology, an optional collagen boosting operating mode that delivers pulsating massage to stimulate collagen & elastin production for more youthful looking skin. The Soniclear Elite is a great addition to my skincare routine! It is very similar to the origional Soniclear. The difference is the new Soniclear Elite brushes have the included C-BoostTM Collagen Technology which is an option to for the brush to turn left and then right quickly which is to increase collagen production. The origional Soniclear models only had that option for the larger body brush. So, essentially the Soniclear is the same as the Soniclear Elite with the difference being the C-BoostTM Collagen Technology in the Elite model. I find that I get best results when I use my Soniclear or Soniclear Elite 2-3 times a week (rather than daily or more freqently) because I have sensitive skin. If I use it any more frequently, I end up with irritation bumps. The Soniclear and Soniclear Elite provides gentle exfoliation and a super deep cleanse. I use the Soniclear Elite in the evenings when I wash my face. I simply wet my face, apply cleanser, wet the Soniclear Elite, and then gently move the Soniclear Elite over my face, and then rinse (and rinse the Soniclear Elite). My skin is left so soft, smooth, and clean! Plus, it allows for better absorption of my skincare products. Prize: 1 winner will get 1 Soniclear Elite. Rules: Please see Giveaway form for more details. Giveaway open to USA only. Pammy Blogs Beauty is not responsible for items lost/damaged in shipping. Prize is not redeemable for cash. 18 or older only. Contest void where prohibited. Giveaway ends: August 31st 2015! No, I don't use any special device to cleanse my face. I currently do not use a facial brush or any similar device, I'd definitely would love to try something like that though. I use the Olay facial brush system. I like it after trying it. Didn't think I would like a face scrubber but it really does make a difference! I had a sonic device that I gave to my daughter to use so could use another one for me! Wow! What a great giveaway! I have never had a sonic face cleaning brush but would love one1 Thanks for the chance. I do not currently use a facial device but I would if I had one! I currently do not use a facial device but would love to win one. No, I've never tried a brush before but would love to! I love my Michael Todd Soniclear Elite! I have never used a cleansing brush, but have always wanted to try one!! No I don't, I've never even tried one before. I had a Clarisonic and just couldn't get that it was so rough?hard? unsure. But have wanted to try something different! Fingers totally crossed :) Thanks for the opportunity! I currently use a Clarisonic. No, I do not own any type of facial brush but would love to. I've had a facial done at Dillards with a facial brush and it has helped my skin. I do not own a facial brush but have had one used on me at a local department store that really helped my skin. Thanks for this awesome giveaway! I currently do not have a cleansing brush ut would love to have one! I don't currently use a facial brush to clean my face, but I've been wanting to try one! I've had a Clarasonic before, and -meh. Never saw any difference. Love Michael Todd products, tho-so excited to try! Yes, I do have a MIA! I currently do not use a facial brush, but I would love to try a good one like this. yes i currently have a clarisonic brush that i brought abt 2 yrs ago. i have had lots of problems with it, has been replaced 3 times already. I use the Clarisonic Aria. I don't have a face brush, I've wanted one for a long time! The only device I've ever used is the Olay Fresh Effects one that sells/sold for $13 at drugstores. I've wanted a good one for so long!! i currently do not have or ever had a cleansing brush but have been looking so get one for my birthday in September! but I'm also heading to college in a few days so we'll see! i use a braun sil epil 7 epilator, it has a brush with it. i use it for body! have yet to try one! I don't use a facial brush or device. They're so expensive! I dont use one but would love to. I use the Olay facial brush. No, I don't use any special devices to cleanse my face. I would like to try this one!